Engine parts are wearing out as it is used. And degree of the damage of parts will be different according to the use condition or the maintenance they get. However, we strongly recommend overhauling your engine according to its used period or total mileage whether you can tell the fall of the performance or not, because all the parts of the engine must get old. Our suggestion of the timing of engine overhaul is about 60.000km to 100.000km for the high load, high RPM engines. Besides all, if you hear any noise or if you doubt the performance reduction of the engine, detailed check must be done immediately. (1)A piston after 70,000km run. Carbon has adhered remarkably. Moreover, gas has blown the bottom of 2nd ring. There must have been a fall of the output that can be felt. (2)The top ring that was worn out and became flattened. Combustion gas pressure is no longer sealed in this state. 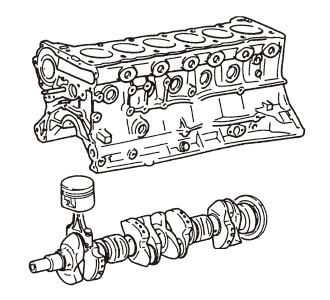 (3)A cylinder that is worn out from the swing of the piston head. Although it is wear of a micron unit, combustion gas has blown to the crankcase. (4)The Con Rod metal that is worn out and exfoliation of overlay has begun. A scratch from foreign substance is also seen. If it kept used, noise will occur. (5)Worn out and distorted valve seat. In this state, sealant of valve cannot be secured. Also, heat from the valve cannot be radiated to the cylinder head. (6)Upper surface of the normal cylinder. The cutter marks of machining remained and the center is dented. It is impossible to giving the quality beyond this in the mass production, where processing time has given the most priority. 新品エンジンや、その組立基準は、組立の早さと材料費の安さが最優先の量産エンジンだということを忘れてはなりません。そうしたエンジンとの差が「精密」という言葉なのです。自動車メーカーで省かれたダミーヘッド付きのボーリングや、プラトーホーニングの実施。金属の熱膨張による寸法変化を抑えるため、室温を20℃±2℃に保つエンジン組立室。また改善が必要な事項に対して独自に設計、製造する専用部品の組み込みなど、私たちの基準は、古くから存在する一般のオーバーホールや組立とは異なるものなのです。 It may dare called the engine overhaul or assembly of TOMEI complete engine, “precision overhaul” and “precision assembly.” This is the word used when distinguishing from the ordinary overhaul and the regular assembly of the engine by carmakers. Since standard of brand-new mass-production engine and its assembly is aiming at the quick assembly and reducing the cost of materials, it may sometimes be unable to assemble the engine perfectly unless taking the special method that is not applied at carmaker’s assembly line and maintenance manual, if pursuing the essence of an engine assembly. 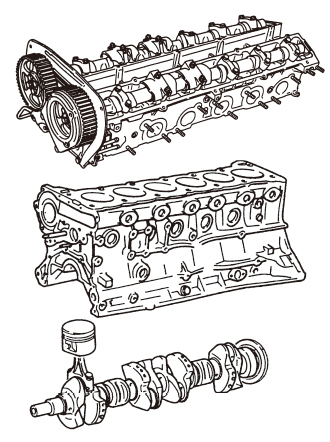 Processes such as cylinder boring with dummy head or plateau horning are carefully given to every engine. (1)The engine block that dummy head is attached for the ﾒpreciseﾓ boring. 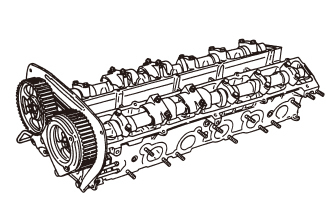 Actual head gasket and head bolt is used for the assembly to concrete the running engine statement. (2)Since size of the parts expands even by the heat from touch with hand, measurement in micron accuracy and adjustment are carried out in the engine assembly room kept at 20℃. Example: When temperature of aluminum material of 10mm thickness warmed to 35℃, the size becomes 0.003mm larger. (4)Valve seat cut is inspected with a valvemaster and a special gauge. Both accuracy and quickness of the work must be secured to reducing its cost. (5)Sealant of the valve is checked after the valve lapping. An angle and width of the valve are adjusted to our original standard that is not in the maintenance manual of an automaker. (6)Cylinder modification is given in TOMEI factory. Many options are prepared by the purpose and use of engine. However, since high performance of the engine is achieved based on the balance of each parts, adherence of raising the performance of specific part beyond the necessity will be waste time and cost. In addition, we can not accept processing of vehicles (engines) 30 years or more after production. ※ A type and L type are excluded.